Home Jesus The True Easter Story Did Jesus Really Resurrect? To Whom Did He Appear And What Did He Say? Did Jesus Really Resurrect? To Whom Did He Appear And What Did He Say? 189:4.11 These human eyes were enabled to see the *morontia form of Jesus because of the special ministry of the transformers and the *midwayers in association with certain of the morontia personalities then accompanying Jesus. 189:4.12 As Mary sought to embrace his feet, Jesus said: "Touch me not, Mary, for I am not as you knew me in the flesh. In this form will I tarry with you for a season before I ascend to the Father. But go, all of you, now and tell my apostles —and Peter—that I have risen, and that you have talked with me." 190:2.1 From the time of the morontia resurrection until the hour of his spirit ascension on high, Jesus made nineteen separate appearances in visible form to his believers on earth. He did not appear to his enemies nor to those who could not make spiritual use of his manifestation in visible form. His first appearance was to the five women at the tomb; his second, to Mary Magdalene, also at the tomb. 190:2.2 The third appearance occurred about noon of this Sunday at Bethany. Shortly after noontide, Jesus' oldest brother, James, was standing in the garden of Lazarus before the empty tomb of the resurrected brother of Martha and Mary, turning over in his mind the news brought to them about one hour previously by the messenger of David. James had always inclined to believe in his eldest brother's mission on earth, but he had long since lost contact with Jesus' work and had drifted into grave doubting regarding the later claims of the apostles that Jesus was the Messiah. The whole family was startled and well-nigh confounded by the news brought by the messenger. 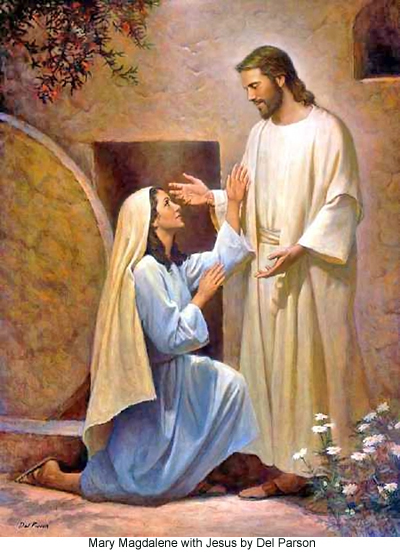 Even as James stood before Lazarus's empty tomb, Mary Magdalene arrived on the scene and was excitedly relating to the family her experiences of the early morning hours at the tomb of Joseph. Before she had finished, David Zebedee and his mother arrived. Ruth, of course, believed the report, and so did Jude after he had talked with David and Salome. 190:2.3 In the meantime, as they looked for James and before they found him, while he stood there in the garden near the tomb, he became aware of a near-by presence, as if someone had touched him on the shoulder; and when he turned to look, he beheld the gradual appearance of a strange form by his side. He was too much amazed to speak and too frightened to flee. And then the strange form spoke, saying: "James, I come to call you to the service of the kingdom. Join earnest hands with your brethren and follow after me." When James heard his name spoken, he knew that it was his eldest brother, Jesus, who had addressed him. They all had more or less difficulty in recognizing the morontia form of the Master, but few of them had any trouble recognizing his voice or otherwise identifying his charming personality when he once began to communicate with them. 190:2.4 When James perceived that Jesus was addressing him, he started to fall to his knees, exclaiming, "My father and my brother," but Jesus bade him stand while he spoke with him. And they walked through the garden and talked for almost three minutes; talked over experiences of former days and forecast the events of the near future. As they neared the house, Jesus said, "Farewell, James, until I greet you all together." 190:2.5 James rushed into the house, even while they looked for him at Bethphage, exclaiming: "I have just seen Jesus and talked with him, visited with him. He is not dead; he has risen! He vanished before me, saying, `Farewell until I greet you all together.'" He had scarcely finished speaking when Jude returned, and he retold the experience of meeting Jesus in the garden for the benefit of Jude. And they all began to believe in the resurrection of Jesus. James now announced that he would not return to Galilee, and David exclaimed: "He is seen not only by excited women; even stronghearted men have begun to see him. I expect to see him myself." 190:2.6 And David did not long wait, for the fourth appearance of Jesus to mortal recognition occurred shortly before two o'clock in this very home of Martha and Mary, when he appeared visibly before his earthly family and their friends, twenty in all. The Master appeared in the open back door, saying: "Peace be upon you. Greetings to those once near me in the flesh and fellowship for my brothers and sisters in the kingdom of heaven. How could you doubt? Why have you lingered so long before choosing to follow the light of truth with a whole heart? Come, therefore, all of you into the fellowship of the Spirit of Truth in the Father's kingdom." As they began to recover from the first shock of their amazement and to move toward him as if to embrace him, he vanished from their sight. 190:2.7 They all wanted to rush off to the city to tell the doubting apostles about what had happened, but James restrained them. Mary Magdalene, only, was permitted to return to Joseph's house. James forbade their publishing abroad the fact of this morontia visit because of certain things which Jesus had said to him as they conversed in the garden. 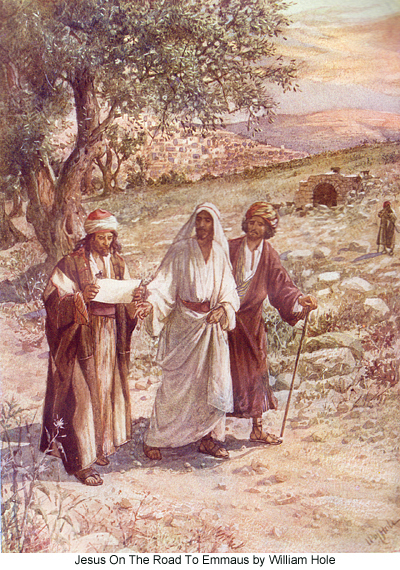 But James never revealed more of his visit with the risen Master on this day at the Lazarus home in Bethany. 190:3.1 The fifth morontia manifestation of Jesus to the recognition of mortal eyes occurred in the presence of some twenty-five women believers assembled at the home of Joseph of Arimathea, at about fifteen minutes past four o'clock on this same Sunday afternoon. Mary Magdalene had returned to Joseph's house just a few minutes before this appearance. James, Jesus' brother, had requested that nothing be said to the apostles concerning the Master's appearance at Bethany. He had not asked Mary to refrain from reporting the occurrence to her sister believers. Accordingly, after Mary had pledged all the women to secrecy, she proceeded to relate what had so recently happened while she was with Jesus' family at Bethany. And she was in the very midst of this thrilling recital when a sudden and solemn hush fell over them; they beheld in their very midst the fully visible form of the risen Jesus. He greeted them, saying: "Peace be upon you. In the fellowship of the kingdom there shall be neither Jew nor gentile, rich nor poor, free nor bond, man nor woman. You also are called to publish the good news of the liberty of mankind through the gospel of sonship with God in the kingdom of heaven. Go to all the world proclaiming this gospel and confirming believers in the faith thereof. And while you do this, forget not to minister to the sick and strengthen those who are faint-hearted and fear-ridden. And I will be with you always, even to the ends of the earth." And when he had thus spoken, he vanished from their sight, while the women fell on their faces and worshiped in silence. 190:3.2 Of the five morontia appearances of Jesus occurring up to this time, Mary Magdalene had witnessed four. 190:3.3 As a result of sending out the messengers during the midforenoon and from the unconscious leakage of intimations concerning this appearance of Jesus at Joseph's house, word began to come to the rulers of the Jews during the early evening that it was being reported about the city that Jesus had risen, and that many persons were claiming to have seen him. The Sanhedrists were thoroughly aroused by these rumors. After a hasty consultation with Annas, Caiaphas called a meeting of the Sanhedrin to convene at eight o'clock that evening. It was at this meeting that action was taken to throw out of the synagogues any person who made mention of Jesus' resurrection. It was even suggested that anyone claiming to have seen him should be put to death; this proposal, however, did not come to a vote since the meeting broke up in confusion bordering on actual panic. They had dared to think they were through with Jesus. They were about to discover that their real trouble with the man of Nazareth had just begun. 190:4.1 About half past four o'clock, at the home of one Flavius, the Master made his sixth morontia appearance to some forty Greek believers there assembled. While they were engaged in discussing the reports of the Master's resurrection, he manifested himself in their midst, notwithstanding that the doors were securely fastened, and speaking to them, said: "Peace be upon you. While the Son of Man appeared on earth among the Jews, he came to minister to all men. In the kingdom of my Father there shall be neither Jew nor gentile; you will all be brethren—the sons of God. Go you, therefore, to all the world, proclaiming this gospel of salvation as you have received it from the ambassadors of the kingdom, and I will fellowship you in the brotherhood of the Father's sons of faith and truth." And when he had thus charged them, he took leave, and they saw him no more. They remained within the house all evening; they were too much overcome with awe and fear to venture forth. Neither did any of these Greeks sleep that night; they stayed awake discussing these things and hoping that the Master might again visit them. Among this group were many of the Greeks who were at Gethsemane when the soldiers arrested Jesus and Judas betrayed him with a kiss. 190:4.2 Rumors of Jesus' resurrection and reports concerning the many appearances to his followers are spreading rapidly, and the whole city is being wrought up to a high pitch of excitement. Already the Master has appeared to his family, to the women, and to the Greeks, and presently he manifests himself in the midst of the apostles. The Sanhedrin is soon to begin the consideration of these new problems which have been so suddenly thrust upon the Jewish rulers. 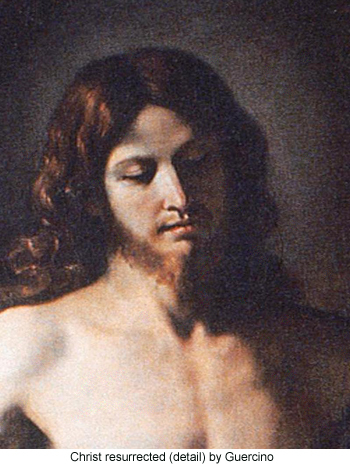 Jesus thinks much about his apostles but desires that they be left alone for a few more hours of solemn reflection and thoughtful consideration before he visits them. *Morontia - A stage of existence that intervenes between life in the spirit and life in the flesh. *Midwayers - The lowest order of angel, ministering in the material worlds, being nearly material but just beyond human vision. 190:5.1 At Emmaus, about seven miles west of Jerusalem, there lived two brothers, shepherds, who had spent the Passover week in Jerusalem attending upon the sacrifices, ceremonials, and feasts. Cleopas, the elder, was a partial believer in Jesus; at least he had been cast out of the synagogue. His brother, Jacob, was not a believer, although he was much intrigued by what he had heard about the Master's teachings and works. 190:5.2 On this Sunday afternoon, about three miles out of Jerusalem and a few minutes before five o'clock, as these two brothers trudged along the road to Emmaus, they talked in great earnestness about Jesus, his teachings, work, and more especially concerning the rumors that his tomb was empty, and that certain of the women had talked with him. Cleopas was half a mind to believe these reports, but Jacob was insistent that the whole affair was probably a fraud. While they thus argued and debated as they made their way toward home, the morontia manifestation of Jesus, his seventh appearance, came alongside them as they journeyed on. Cleopas had often heard Jesus teach and had eaten with him at the homes of Jerusalem believers on several occasions. But he did not recognize the Master even when he spoke freely with them. 190:5.3 After walking a short way with them, Jesus said: "What were the words you exchanged so earnestly as I came upon you?" And when Jesus had spoken, they stood still and viewed him with sad surprise. Said Cleopas: "Can it be that you sojourn in Jerusalem and know not the things which have recently happened?" Then asked the Master, "What things?" Cleopas replied: "If you do not know about these matters, you are the only one in Jerusalem who has not heard these rumors concerning Jesus of Nazareth, who was a prophet mighty in word and in deed before God and all the people. The chief priests and our rulers delivered him up to the Romans and demanded that they crucify him. Now many of us had hoped that it was he who would deliver Israel from the yoke of the gentiles. But that is not all. It is now the third day since he was crucified, and certain women have this day amazed us by declaring that very early this morning they went to his tomb and found it empty. And these same women insist that they talked with this man; they maintain that he has risen from the dead. And when the women reported this to the men, two of his apostles ran to the tomb and likewise found it empty"—and here Jacob interrupted his brother to say, "but they did not see Jesus." 190:5.4 As they walked along, Jesus said to them: "How slow you are to comprehend the truth! When you tell me that it is about the teachings and work of this man that you have your discussions, then may I enlighten you since I am more than familiar with these teachings. 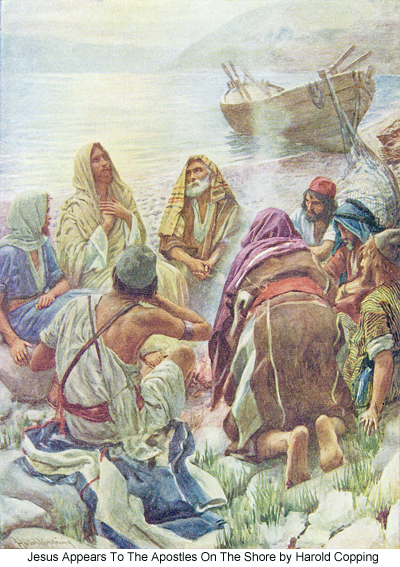 Do you not remember that this Jesus always taught that his kingdom was not of this world, and that all men, being the sons of God, should find liberty and freedom in the spiritual joy of the fellowship of the brotherhood of loving service in this new kingdom of the truth of the heavenly Father's love? Do you not recall how this Son of Man proclaimed the salvation of God for all men, ministering to the sick and afflicted and setting free those who were bound by fear and enslaved by evil? Do you not know that this man of Nazareth told his disciples that he must go to Jerusalem, be delivered up to his enemies, who would put him to death, and that he would arise on the third day? Have you not been told all this? And have you never read in the Scriptures concerning this day of salvation for Jew and gentile, where it says that in him shall all the families of the earth be blessed; that he will hear the cry of the needy and save the souls of the poor who seek him; that all nations shall call him blessed? That such a Deliverer shall be as the shadow of a great rock in a weary land. That he will feed the flock like a true shepherd, gathering the lambs in his arms and tenderly carrying them in his bosom. That he will open the eyes of the spiritually blind and bring the prisoners of despair out into full liberty and light; that all who sit in darkness shall see the great light of eternal salvation. That he will bind up the brokenhearted, proclaim liberty to the captives of sin, and open up the prison to those who are enslaved by fear and bound by evil. That he will comfort those who mourn and bestow upon them the joy of salvation in the place of sorrow and heaviness. That he shall be the desire of all nations and the everlasting joy of those who seek righteousness. That this Son of truth and righteousness shall rise upon the world with healing light and saving power; even that he will save his people from their sins; that he will really seek and save those who are lost. That he will not destroy the weak but minister salvation to all who hunger and thirst for righteousness. That those who believe in him shall have eternal life. That he will pour out his spirit upon all flesh, and that this Spirit of Truth shall be in each believer a well of water, springing up into everlasting life. Did you not understand how great was the gospel of the kingdom which this man delivered to you? Do you not perceive how great a salvation has come upon you?" 190:5.5 By this time they had come near to the village where these brothers dwelt. Not a word had these two men spoken since Jesus began to teach them as they walked along the way. Soon they drew up in front of their humble dwelling place, and Jesus was about to take leave of them, going on down the road, but they constrained him to come in and abide with them. They insisted that it was near nightfall, and that he tarry with them. Finally Jesus consented, and very soon after they went into the house, they sat down to eat. They gave him the bread to bless, and as he began to break and hand to them, their eyes were opened, and Cleopas recognized that their guest was the Master himself. And when he said, "It is the Master—," the morontia Jesus vanished from their sight. 190:5.6 And then they said, the one to the other, "No wonder our hearts burned within us as he spoke to us while we walked along the road! and while he opened up to our understanding the teachings of the Scriptures!" 190:5.7 They would not stop to eat. They had seen the morontia Master, and they rushed from the house, hastening back to Jerusalem to spread the good news of the risen Savior. 190:5.8 About nine o'clock that evening and just before the Master appeared to the ten, these two excited brothers broke in upon the apostles in the upper chamber, declaring that they had seen Jesus and talked with him. And they told all that Jesus had said to them and how they had not discerned who he was until the time of the breaking of the bread. 191:1.1 It was near half past eight o'clock this Sunday evening when Jesus appeared to Simon Peter in the garden of the Mark home. This was his eighth morontia manifestation. Peter had lived under a heavy burden of doubt and guilt ever since his denial of the Master. All day Saturday and this Sunday he had fought the fear that, perhaps, he was no longer an apostle. He had shuddered at the fate of Judas and even thought that he, too, had betrayed his Master. All this afternoon he thought that it might be his presence with the apostles that prevented Jesus' appearing to them, provided, of course, he had really risen from the dead. And it was to Peter, in such a frame of mind and in such a state of soul, that Jesus appeared as the dejected apostle strolled among the flowers and shrubs. 191:1.2 When Peter thought of the loving look of the Master as he passed by on Annas's porch, and as he turned over in his mind that wonderful message brought him early that morning by the women who came from the empty tomb, "Go tell my apostles —and Peter"— as he contemplated these tokens of mercy, his faith began to surmount his doubts, and he stood still, clenching his fists, while he spoke aloud: "I believe he has risen from the dead; I will go and tell my brethren." And as he said this, there suddenly appeared in front of him the form of a man, who spoke to him in familiar tones, saying: "Peter, the enemy desired to have you, but I would not give you up. I knew it was not from the heart that you disowned me; therefore I forgave you even before you asked; but now must you cease to think about yourself and the troubles of the hour while you prepare to carry the good news of the gospel to those who sit in darkness. No longer should you be concerned with what you may obtain from the kingdom but rather be exercised about what you can give to those who live in dire spiritual poverty. Gird yourself, Simon, for the battle of a new day, the struggle with spiritual darkness and the evil doubtings of the natural minds of men." 191:1.3 Peter and the morontia Jesus walked through the garden and talked of things past, present, and future for almost five minutes. Then the Master vanished from his gaze, saying, "Farewell, Peter, until I see you with your brethren." 191:1.4 For a moment, Peter was overcome by the realization that he had talked with the risen Master, and that he could be sure he was still an ambassador of the kingdom. He had just heard the glorified Master exhort him to go on preaching the gospel. And with all this welling up within his heart, he rushed to the upper chamber and into the presence of his fellow apostles, exclaiming in breathless excitement: "I have seen the Master; he was in the garden. I talked with him, and he has forgiven me." 191:1.5 Peter's declaration that he had seen Jesus in the garden made a profound impression upon his fellow apostles, and they were about ready to surrender their doubts when Andrew got up and warned them not to be too much influenced by his brother's report. Andrew intimated that Peter had seen things which were not real before. Although Andrew did not directly allude to the vision of the night on the Sea of Galilee wherein Peter claimed to have seen the Master coming to them walking on the water, he said enough to betray to all present that he had this incident in mind. Simon Peter was very much hurt by his brother's insinuations and immediately lapsed into crestfallen silence. The twins felt very sorry for Peter, and they both went over to express their sympathy and to say that they believed him and to reassert that their own mother had also seen the Master. 191:2.1 Shortly after nine o'clock that evening, after the departure of Cleopas and Jacob, while the Alpheus twins comforted Peter, and while Nathaniel remonstrated with Andrew, and as the ten apostles were there assembled in the upper chamber with all the doors bolted for fear of arrest, the Master, in morontia form, suddenly appeared in the midst of them, saying: "Peace be upon you. Why are you so frightened when I appear, as though you had seen a spirit? Did I not tell you about these things when I was present with you in the flesh? Did I not say to you that the chief priests and the rulers would deliver me up to be killed, that one of your own number would betray me, and that on the third day I would rise? Wherefore all your doubtings and all this discussion about the reports of the women, Cleopas and Jacob, and even Peter? How long will you doubt my words and refuse to believe my promises? And now that you actually see me, will you believe? Even now one of you is absent. When you are gathered together once more, and after all of you know of a certainty that the Son of Man has risen from the grave, go hence into Galilee. Have faith in God; have faith in one another; and so shall you enter into the new service of the kingdom of heaven. I will tarry in Jerusalem with you until you are ready to go into Galilee. My peace I leave with you." 191:2.2 When the morontia Jesus had spoken to them, he vanished in an instant from their sight. And they all fell on their faces, praising God and venerating their vanished Master. This was the Master's ninth morontia appearance. 191:4.1 The tenth morontia manifestation of Jesus to mortal recognition occurred a short time after eight o'clock on Tuesday, April 11, at Philadelphia, where he showed himself to Abner and Lazarus and some one hundred and fifty of their associates, including more than fifty of the evangelistic corps of the seventy. This appearance occurred just after the opening of a special meeting in the synagogue which had been called by Abner to discuss the crucifixion of Jesus and the more recent report of the resurrection which had been brought by David's messenger. Inasmuch as the resurrected Lazarus was now a member of this group of believers, it was not difficult for them to believe the report that Jesus had risen from the dead. 191:4.3 "Peace be upon you. You all know that we have one Father in heaven, and that there is but one gospel of the kingdom—the good news of the gift of eternal life which men receive by faith. As you rejoice in your loyalty to the gospel, pray the Father of truth to shed abroad in your hearts a new and greater love for your brethren. You are to love all men as I have loved you; you are to serve all men as I have served you. With understanding sympathy and brotherly affection, fellowship all your brethren who are dedicated to the proclamation of the good news, whether they be Jew or gentile, Greek or Roman, Persian or Ethiopian. John proclaimed the kingdom in advance; you have preached the gospel in power; the Greeks already teach the good news; and I am soon to send forth the Spirit of Truth into the souls of all these, my brethren, who have so unselfishly dedicated their lives to the enlightenment of their fellows who sit in spiritual darkness. You are all the children of light; therefore stumble not into the misunderstanding entanglements of mortal suspicion and human intolerance. If you are ennobled, by the grace of faith, to love unbelievers, should you not also equally love those who are your fellow believers in the far-spreading household of faith? Reme mber, as you love one another, all men will know that you are my disciples. 191:4.4 "Go, then, into all the world proclaiming this gospel of the fatherhood of God and the brotherhood of men to all nations and races and ever be wise in your choice of methods for presenting the good news to the different races and tribes of mankind. Freely you have received this gospel of the kingdom, and you will freely give the good news to all nations. Fear not the resistance of evil, for I am with you always, even to the end of the ages. And my peace I leave with you." 191:4.5 When he had said, "My peace I leave with you," he vanished from their sight. With the exception of one of his appearances in Galilee, where upward of five hundred believers saw him at one time, this group in Philadelphia embraced the largest number of mortals who saw him on any single occasion. 191:4.6 Early the next morning, even while the apostles tarried in Jerusalem awaiting the emotional recovery of Thomas, these believers at Philadelphia went forth proclaiming that Jesus of Nazareth had risen from the dead. 191:4.7 The next day, Wednesday, Jesus spent without interruption in the society of his morontia associates, and during the midafternoon hours he received visiting morontia delegates from the mansion worlds of every local system of inhabited spheres throughout the constellation of Norlatiadek. And they all rejoiced to know their Creator as one of their own order of universe intelligence. 191:5.1 Thomas spent a lonesome week alone with himself in the hills around about Olivet. During this time he saw only those at Simon's house and John Mark. 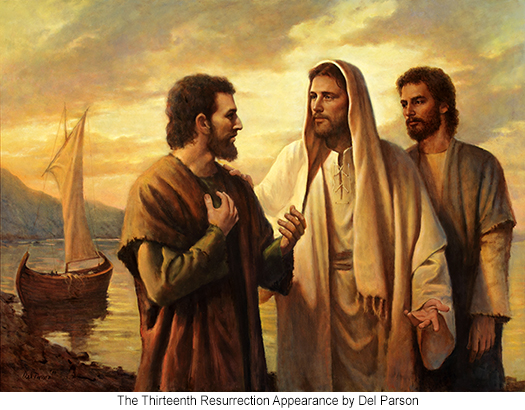 It was about nine o'clock on Saturday, April 15, when the two apostles found him and took him back with them to their rendezvous at the Mark home. The next day Thomas listened to the telling of the stories of the Master's various appearances, but he steadfastly refused to believe. He maintained that Peter had enthused them into thinking they had seen the Master. Nathaniel reasoned with him, but it did no good. There was an emotional stubbornness associated with his customary doubtfulness, and this state of mind, coupled with his chagrin at having run away from them, conspired to create a situation of isolation which even Thomas himself did not fully understand. He had withdrawn from his fellows, he had gone his own way, and now, even when he was back among them, he unconsciously tended to assume an attitude of disagreement. He was slow to surrender; he disliked to give in. Without intending it, he really enjoyed the attention paid him; he derived unconscious satisfaction from the efforts of all his fellows to convince and convert him. He had missed them for a full week, and he obtained considerable pleasure from their persistent attentions. 191:5.3 "Peace be upon you. For a full week have I tarried that I might appear again when you were all present to hear once more the commission to go into all the world and preach this gospel of the kingdom. Again I tell you: As the Father sent me into the world, so send I you. As I have revealed the Father, so shall you reveal the divine love, not merely with words, but in your daily living. I send you forth, not to love the souls of men, but rather to love men. You are not merely to proclaim the joys of heaven but also to exhibit in your daily experience these spirit realities of the divine life since you already have eternal life, as the gift of God, through faith. When you have faith, when power from on high, the Spirit of Truth, has come upon you, you will not hide your light here behind closed doors; you will make known the love and the mercy of God to all mankind. Through fear you now flee from the facts of a disagreeable experience, but when you shall have been baptized with the Spirit of Truth, you will bravely and joyously go forth to meet the new experiences of proclaiming the good news of eternal life in the kingdom of God. You may tarry here and in Galilee for a short season while you recover from the shock of the transition from the false security of the authority of traditionalism to the new order of the authority of facts, truth, and faith in the supreme realities of living experience. Your mission to the world is founded on the fact that I lived a God-revealing life among you; on the truth that you and all other men are the sons of God; and it shall consist in the life which you will live among men—the actual and living experience of loving men and serving them, even as I have loved and served you. Let faith reveal your light to the world; let the revelation of truth open the eyes blinded by tradition; let your loving service effectually destroy the prejudice engendered by ignorance. By so drawing close to your fellow men in understanding sympathy and with unselfish devotion, you will lead them into a saving knowledge of the Father's love. The Jews have extolled goodness; the Greeks have exalted beauty; the Hindus preach devotion; the faraway ascetics teach reverence; the Romans demand loyalty; but I require of my disciples life, even a life of loving service for your brothers in the flesh." 191:5.4 When the Master had so spoken, he looked down into the face of Thomas and said: "And you, Thomas, who said you would not believe unless you could see me and put your finger in the nail marks of my hands, have now beheld me and heard my words; and though you see no nail marks on my hands, since I am raised in the form that you also shall have when you depart from this world, what will you say to your brethren? You will acknowledge the truth, for already in your heart you had begun to believe even when you so stoutly asserted your unbelief. Your doubts, Thomas, always most stubbornly assert themselves just as they are about to crumble. Thomas, I bid you be not faithless but believing—and I know you will believe, even with a whole heart." 191:5.5 When Thomas heard these words, he fell on his knees before the morontia Master and exclaimed, "I believe! My Lord and my Master!" Then said Jesus to Thomas: "You have believed, Thomas, because you have really seen and heard me. Blessed are those in the ages to come who will believe even though they have not seen with the eye of flesh nor heard with the mortal ear." 191:5.6 And then, as the Master's form moved over near the head of the table, he addressed them all, saying: "And now go all of you to Galilee, where I will presently appear to you." After he said this, he vanished from their sight. 191:5.7 The eleven apostles were now fully convinced that Jesus had risen from the dead, and very early the next morning, before the break of day, they started out for Galilee. 191:6.2 "Peace be upon you. That which my Father sent me into the world to establish belongs not to a race, a nation, nor to a special group of teachers or preachers. This gospel of the kingdom belongs to both Jew and gentile, to rich and poor, to free and bond, to male and female, even to the little children. And you are all to proclaim this gospel of love and truth by the lives which you live in the flesh. You shall love one another with a new and startling affection, even as I have loved you. You will serve mankind with a new and amazing devotion, even as I have served you. And when men see you so love them, and when they behold how fervently you serve them, they will perceive that you have become faith-fellows of the kingdom of heaven, and they will follow after the Spirit of Truth which they see in your lives, to the finding of eternal salvation. 191:6.3 "As the Father sent me into this world, even so now send I you. You are all called to carry the good news to those who sit in darkness. This gospel of the kingdom belongs to all who believe it; it shall not be committed to the custody of mere priests. Soon will the Spirit of Truth come upon you, and he shall lead you into all truth. Go you, therefore, into all the world preaching this gospel, and lo, I am with you always, even to the end of the ages." 191:6.4 When the Master had so spoken, he vanished from their sight. All that night these believers remained there together recounting their experiences as kingdom believers and listening to the many words of Rodan and his associates. And they all believed that Jesus had risen from the dead. Imagine the surprise of David's herald of the resurrection, who arrived the second day after this, when they replied to his announcement, saying: "Yes, we know, for we have seen him. He appeared to us day before yesterday." 192:2.2 Jesus then turned toward Peter and asked, "Peter, do you love me?" Peter answered, "Lord, you know I love you with all my soul. " Then said Jesus: "If you love me, Peter, feed my lambs. Do not neglect to minister to the weak, the poor, and the young. Preach the gospel without fear or favor; remember always that God is no respecter of persons. Serve your fellow men even as I have served you; forgive your fellow mortals even as I have forgiven you. Let experience teach you the value of meditation and the power of intelligent reflection." 192:2.12 And then, speaking to Matthew, the Master asked, "Matthew, do you have it in your heart to obey me?" Matthew answered, "Yes, Lord, I am fully dedicated to doing your will." Then said the Master: "Matthew, if you would obey me, go forth to teach all people s this gospel of the kingdom. No longer will you serve your brethren the material things of life; henceforth you are also to proclaim the good news of spiritual salvation. From now on have an eye single only to obeying your commission to preach this gospel of the Father's kingdom. As I have done the Father's will on earth, so shall you fulfill the divine commission. Remember, both Jew and gentile are your brethren. Fear no man when you proclaim the saving truths of the gospel of the kingdom of heaven. And where I go, you shall presently come." 192:2.13 Then he walked and talked with the Alpheus twins, James and Judas, and speaking to both of them, he asked, "James and Judas, do you believe in me?" And when they both answered, "Yes, Master, we do believe," he said: "I will soon leave you. You see that I have already left you in the flesh. I tarry only a short time in this form before I go to my Father. You believe in me—you are my apostles, and you always will be. Go on believing and remembering your association with me, when I am gone, and after you have, perchance, returned to the work you used to do before you came to live with me. Never allow a change in your outward work to influence your allegiance. Have faith in God to the end of your days on earth. Never forget that, when you are a faith son of God, all upright work of the realm is sacred. Nothing which a son of God does can be common. Do your work, therefore, from this time on, as for God. And when you are through on this world, I have other and better worlds where you shall likewise work for me. And in all of this work, on this world and on other worlds, I will work with you, and my spirit shall dwell within you." 192:4.4 Because of certain things said to the eleven while they were in conference with the Master on the mount of ordination, the apostles received the impression that their Master would presently make a public appearance before a group of the Galilean believers , and that, after he had done so, they were to return to Jerusalem. Accordingly, early the next day, Sunday, April 30, the eleven left Bethsaida for Jerusalem. They did considerable teaching and preaching on the way down the Jordan, so that they did not arrive at the home of the Marks in Jerusalem until late on Wednesday, May 3. 192:4.7 On Thursday night the apostles had a wonderful meeting in this upper chamber and all pledged themselves to go forth in the public preaching of the new gospel of the risen Lord except Thomas, Simon Zelotes, and the Alpheus twins. Already had begun the first steps of changing the gospel of the kingdom—sonship with God and brotherhood with man—into the proclamation of the resurrection of Jesus. Nathaniel opposed this shift in the burden of their public message, but he could not withstand Peter's eloquence, neither could he overcome the enthusiasm of the disciples, especially the women believers. 193:0.2 "Peace be upon you. This is the most representative group of believers— apostles and disciples, both men and women—to which I have appeared since the time of my deliverance from the flesh. I now call you to witness that I told you beforehand that my sojourn among you must come to an end; I told you that presently I must return to the Father. And then I plainly told you how the chief priests and the rulers of the Jews would deliver me up to be put to death, and that I would rise from the grave. Why, then, did you allow yourselves to become so disconcerted by all this when it came to pass? and why were you so surprised when I rose from the tomb on the third day? You failed to believe me because you heard my words without comprehending the meaning thereof. 193:0.3 "And now you should give ear to my words lest you again make the mistake of hearing my teaching with the mind while in your hearts you fail to comprehend the meaning. From the beginning of my sojourn as one of you, I taught you that my one purpose was to reveal my Father in heaven to his children on earth. I have lived the God-revealing bestowal that you might experience the God- knowing career. I have revealed God as your Father in heaven; I have revealed you as the sons of God on earth. It is a fact that God loves you, his sons. By faith in my word this fact becomes an eternal and living truth in your hearts. When, by living faith, you become divinely God-conscious, you are then born of the spirit as children of light and life, even the eternal life wherewith you shall ascend the universe of universes and attain the experience of finding God the Father on Paradise.